When used well, patterns can be a great way to add an extra element to your designs that take them to the next level in terms of aesthetics. Creating your own repeating patterns is one way to go about this, but it’s not always something you want to spend a lot of time on, especially if you’re working with a tight budget. And why reinvent the wheel when there are thousands of patterns out there that could work? The resources below can help you find the right pattern for your project. Rather than just round up the best patterns, we’ll leave finding the perfect pattern to you, since every project has different needs. And for those of you who do want to create your own patterns, we’ve included a few tutorials at the end. The patterns included here run the full spectrum of design styles, from clean and modern to vintage and grungy. PatternCooler has more than 180 patterns available, and all of them can be customized with color schemes and repeat sizes to your liking. Patterrific has tons of tiling patterns available, mostly organized into collections based on color. We usually think of Brusheezy as a great place for free Photoshop brushes, but they also have a great pattern selection with close to 100 patterns. With more than 250 patterns available in a variety of different style, Free Photoshop Patterns is definitely worth browsing. 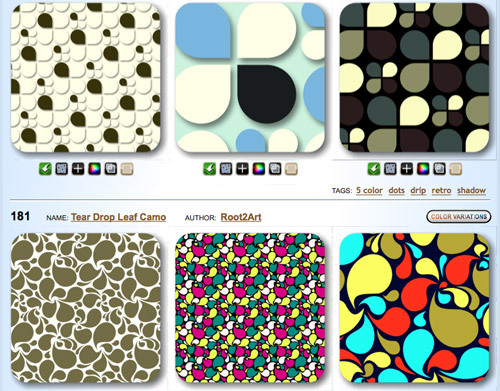 Patternhead offers a huge selection of high-quality vector patterns, mostly grouped by theme. WebTreats ETC has a great collection of patterns available, in a variety of styles. They have some of the better grunge patterns available right now. Pixels & Ice Cream has some fantastic free patterns available, though be aware that there are a few premium patterns mistakenly included in the free category. DeviantART’s Photoshop patterns category is probably the largest collection of patterns available online. Like everything on DeviantART, quality varies widely, but for the most part the patterns you’ll find here are excellent. This German site offers some great patterns, though registration is required before you can download them. Colorburned has a small selection of high-quality patterns available, mostly for Illustrator. Pattern8 has a great selection of patterns including virtually every style out there. You won’t find many minimalist patterns here, but if you’re looking for something that’s visually complex, it’s the go-to source. You can preview any of hte patterns on the website’s own background. This site offers nearly 40 free background patterns. Each preview image shows not only the repeated version of the pattern, but also shows what portion of the preview is the actual pattern. This site aggregates high-quality patterns from a variety of sources, including DeviantART. Free Photoshop’s patterns are varied in style, but unfortunately there’s no great way to sort through them, other than looking page-by-page. Screentones offers a small selection of comic-book inspired patterns, including dots and screens, lines, and static. Klukeart has a small collection of very unique patterns available. Pixel-style patterns aren’t as popular as they were a decade ago (when bandwidth and tiny file sizes were a huge consideration in web design), but that doesn’t mean they don’t still have a place in more modern web design. Here are some great sources for finding pixel patterns. Velvet Factory offers a big collection of pixel patterns, many that are obviously influenced by fractal art. Squidfingers is a great place to find free repeating pixel patterns in a variety of styles and colors. Ava7 is another great place to find a variety of pixel patterns. Unlike many other sites offering pixel patterns, though, they offer ways to sort by shape and color. K10K has pixel patterns from a variety of artists. Licenses vary depending on the creator, so be sure to check before using them. Even with all the resources for finding patterns above, it’s possible you might not come across a pattern that fits your project perfectly. In that case, you might need to make your own. The tutorials below can help you do just that. This tutorial from PSHERO shows how to create a complicated repeating pattern in Photoshop from an image (in the example, they use part of a wallpaper pattern). This tutorial shows how to create a repeating pattern entirely from scratch using Illustrator. This tutorial from Digital Arts shows how to create very complex repeating patterns using Illustrator. This Psdtuts+ tutorial shows how to take almost any texture and turn it into a seamless pattern. This tutorial from BittBox shows how to create a vector pattern in Illustrator that tiles seamlessly. There are a ton of pattern creators out there, and thankfully a large number of them put their work up on sites like DeviantART, making it easier for designers to find good patterns to use in their work. Make sure you check licensing terms on all the patterns you use, as they vary widely between creators. Thanks for the resource, bookmarked. wonderful, very useful post. much appreciation! Thanks for the excellent resource, to cool patterns. You can also add patternsshop.com to your list. Oh, cool collection. Thank you! Great resources, thank you for including Patterrific! Love the Brusheezy’s Patterns.They are really nice. These are really nice patterns! Thank you. Very great resources! Thank you.